With spring break and summer planning all around, I am hearing more and more people talk about going to Disney. Although I've only been a few times--I'm certainly not seasoned like many people who write about it--I have figured out some money-saving tips along my way. Today, I've got dining options on my mind. Walt Disney World parks allow guests to bring snacks in, which can save you money if you're willing to carry them around. We have done this in the past, but just easy-to-carry basics like granola bars and peanut butter crackers for sudden hunger pangs. Whether you plan to bring in snacks or not, here are a few things to keep in mind. When selecting a "table service" meal, you will be paying by the person, not by how much you eat. By choosing to visit "quick service" locations, however, you can buy only what your group needs. During a stay in 2014, our family of three often bought one meal or one meal and an extra side to share between us. We ate more frequently than others might have, but it gave us great, built-in rests throughout the day. It also meant that most of the time, we avoided mealtime rushes in these restaurants. We don't typically eat big meals at home, either, so grazing worked great for us. We had the opportunity to try different foods in many dining spots throughout the parks. And we were never too full to want to start walking and riding again right away. Recent favorites in Magic Kingdom included Be Our Guest Restaurant and Pecos Bill Tale Tall Inn and Cafe. 2. Many on-site restaurants are able to accommodate allergies. More information is available on their website and by calling guest services, but there are lots of choices for those working with dietary restrictions. During a stay shortly after Pip was diagnosed with celiac disease, we spoke with our host at a buffet breakfast at Hollywood and Vine, and the chef came to our table and asked if he could make special gluten free Mickey waffles just for her. She was thrilled, and I was impressed. And grateful. 3. Character breakfasts are amazing. We've done character breakfasts and character lunches, and I definitely recommend the breakfasts. You're promised an amazing experience at either, and I have no doubt that you'll get it, but there's something wonderful about having that personal experience first thing in the morning, while you're still fresh and happy and you haven't gotten hot or tired making your way around the park. Having our scheduled item completed early in the day also meant we could take our time getting everywhere else we wanted to go with no worry about missing our reservation. These are "table service" meals, which means they're in the highest cost bracket. Breakfast is the least expensive meal to enjoy with table service, though, while still meeting and greeting the characters while you dine. I can't pick a favorite here, but I can suggest that you don't overlook character meals at resorts like The Grand Floridian and Ohana. I've never purchased a Disney Dining plan when visiting the parks, we've only paid as we've eaten, but I'd love to hear from you! 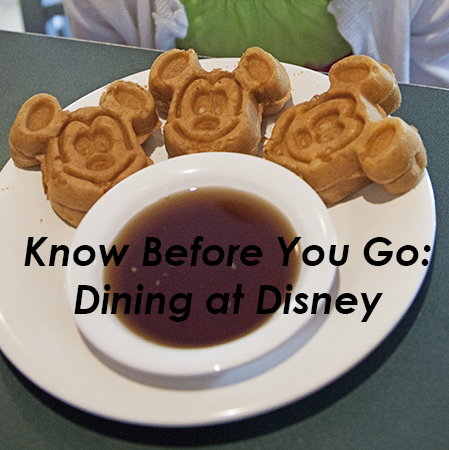 How do you handle meals and snacks when you visit Walt Disney World? We went in December and had a Dining plan - best decision we ever made! Not only did we have 14 months to pay on the plan, but when we got there and saw the actual prices, we ended up saving a ton of $$! You get a X amount of meals and snacks each day per person, but they roll over if you don't use them, and they don't expire until midnight on the last day of your stay. Having two small kids in our group that didn't eat very much at all, and 4 adults, this really helped us! I can't explain how nice it was to have them CM scan our Magic Bands and not have to worry about how much money the food was!